Even though men-in-blue led by Virat Kohli lost its first match against New Zealand of three match One Day International series by six-wicket yet the Indian fans rejoiced that day because Indian skipper Virat Kohli added one more feather to his cap. The 'run machine' of Indian cricket Virat Kohli scored the 31st century of his career on Sunday and surpassed Ricky Ponting's record by becoming the second cricketer to score the highest number of centuries in the ODI format. Now Kohli is only behind legendary cricketer Sachin Tendulkar who has scored 49 centuries. Going by the way Kohli's career is shaping up, it seems that there is nothing that the cricketer cannot do on the ground. Here is the highlight of Virat Kohli's glorious career which shows that his average is way better than Sachin Tendulkar and he has gone past Ricky Pointing in number of ODI centuries. 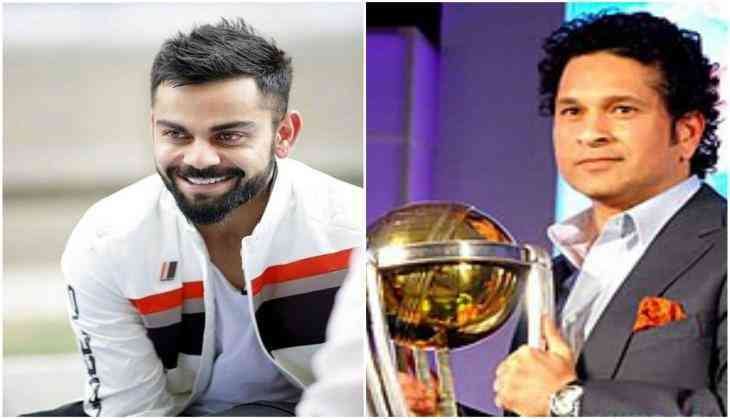 The achievements of Sachin Tendulkar will always remain special for all the cricket fans and with the arrival of Virat Kohli, the pain of Tendulkar's retirement has eased a little. Time and again, Kohli is compared to cricket greats because the young cricketer has achieved a lot in the short span of his career that many others couldn't. Sachin's overall average is 44.83 but Virat's playing average is 55.55. Every single cricket fan knows that he is the best chaser on the cricket ground but the question is how good is he? Sachin had 17 of his 49 hundred while chasing, while Kohli has scored 19 centuries out of his total 31 centuries following the target. He is not just a good hunter but whenever he goes out for hunting India had won. In Kohli's 19 centuries, India had won 17 matches. Virat Kohli is the 5th batter across the globe who have scored 1000 plus runs in a year five times, other than Virat, Tendulkar have also achieved this feat and he had done it seven times. While former Indian skipper Sourav Ganguly, former Aussie skipper Ricky Pointing and former Sri Lankan skipper have done this six times. Kohli is also the second batsman who has scored 5 consecutive hundreds after AB de Villiers who is also popularly known as Mr 360. Records set by Virat Kohli talk a lot about his talent. He has turn around destiny with his dedication and hard-work. It can be rightly said that he, not the upcoming Sachin Tendulkar, but he is the first Virat Kohli.